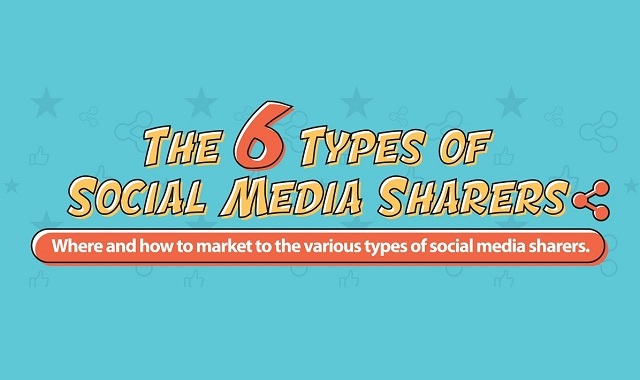 The 6 Types of Social Media Sharers #infographic ~ Visualistan '+g+"
Billions of social shares are posted every single day on Facebook, Twitter, Snapchat, and various other social networks. From cute photos of kittens to hyper-serious and actionable pieces about the environment, politics, and science, there is no shortage of the types of articles that are distributed through our social media accounts. A 2016 study by social management tool, Social Pilot, found that 1.3 million pieces of content are shared on Facebook every minute of every day while 500 million tweets are distributed on Twitter every 24 hours. Pinterest users have created more than 50 billion pins across 1 billion boards. While there are billions of daily social shares, the types of people who share those articles are rather limited. A recent white paper by The New York Times Customer Insight Group uncovered the 6 most popular type of social sharers. These individuals have their own very specific reasons for sharing content.